Last semester, we started working on reshaping the door opening. We pulled out rotten bricks and dug out deteriorating mortar. This semester we finished filling in the open spaces on the wall and are now working toward building a door jamb to fit the new opening. 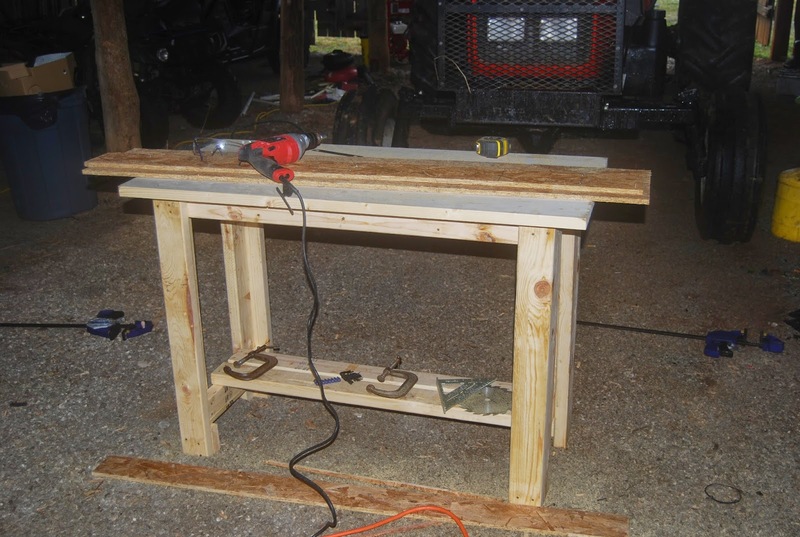 Before we could begin, I needed to build some of the tools to help us build the door jamb. 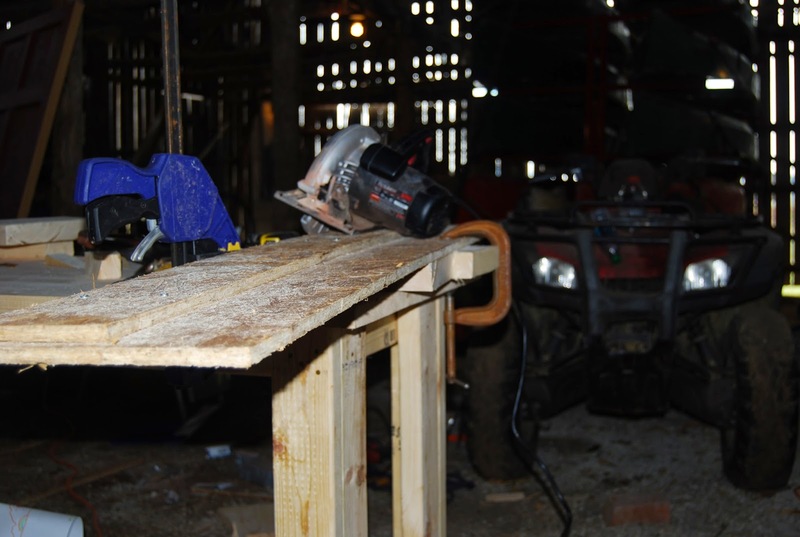 Here is our workbench, and on top of the workbench, is a rip fence, made of OSB plywood. 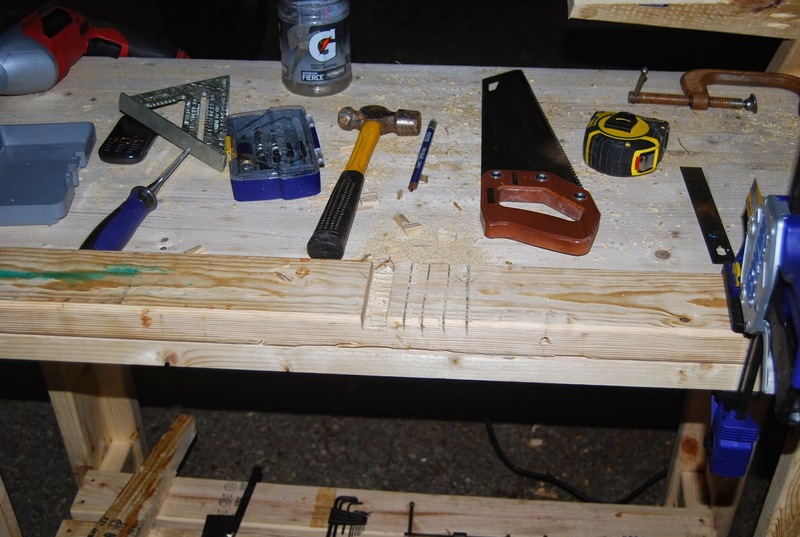 The rip fence was built to match the exact dimensions of my hand-held circular saw, so that I could push the saw directly against the clamped fence, to create a straight cut, "ripping" through wood along or across the grain. 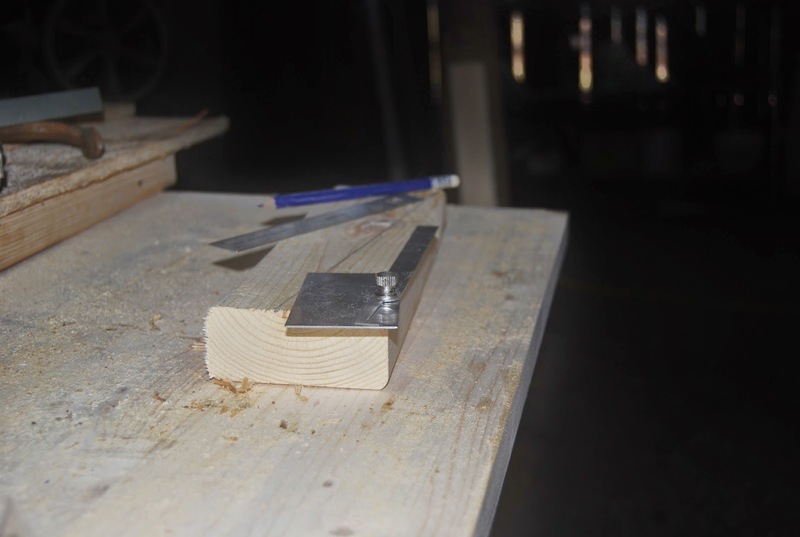 The most difficult cuts on the circular saw were for the bottom portion of the door jamb. I managed to measure the pitch of the hand-cut stone drip edge threshold at 10 degrees. So, I needed to taper the bottom end of the door jamb downward from the indoor side, outdoor at a 10 degree angle. Here is one of the trickier cuts on one of the bottom pieces. I learned that my saw is not powerful enough for precise ripping, unless I do little things to help it like making relief cuts with my handsaw, and just plain going slow. Another challenge was that I had no idea how to cut the mortises and dadoes for the hinges and door jamb supports. I figured that my best bet was a hammer and chisel, since my only power tools were a hand held circular saw and a drill. I used a circular saw to make measured relief cuts for my dadoes, then cleaned them out with the chisel, whereas for the door hinge mortises, I used only a hammer and chisel. It seemed more accurate that way. There were some problems and struggles along the way, but this moment was really satisfying. Not only does the door fit nicely in the jamb, but the jamb fits nicely in the opening. I realized during this moment of truth, that my hole saw does not cut deep enough to work two-inch wood, and that I am not strong enough to hang this door by myself. I was advised to mount the hinges, then just "drop the pins" through the hinge holes, but the commercial grade hinges we have had fixed pins, so I would have had to support the whole weight of the door with one arm and drive the screws with the other. Probably not. So, the old door and jamb are still in place and the new door and jamb are sitting in the parlor, waiting for next weekend. Eventually, we are committed to a swinging door by the end of the semester. The open panels on the door jamb you see are left that way to accommodate a black walnut decorative center panel that will be recessed to the level of the interior structural pieces and finish nailed to the cross-pieces. We will attempt to rout the decorative reeded pattern into them before we set them in place. It’s great that you guys managed to make your own jamb for the new door. I bet you saved some money by doing it on your own. This thing could take some time and a lot of work, and I think you guys did a great job at that. Anyway, were you able to install them already? Thanks for sharing this with us. All the best! Greg Marshall @ Crawford Door Of WNY Inc. 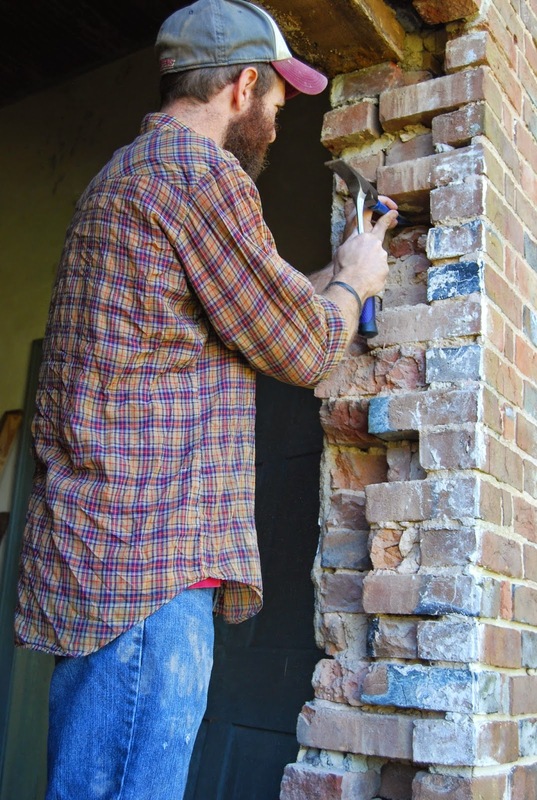 Were you able to find a pattern for the door jamb? It looks very sturdy, and I think it’ll hold up quite nicely. Anyway, I hope the door is still in good condition. Thanks for sharing this with us. Have a great day! The door looks great. Just wondering what precautions you are taking to make sure the paint does not stick. 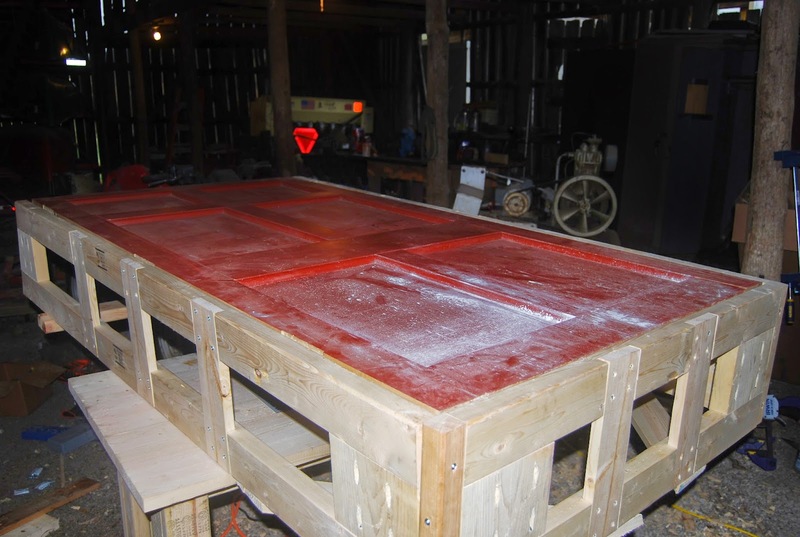 Hopefully, you primed and sanded the frame and door to within an inch of their life to make sure the paint does not peal. Wow, it looks like a lot of effort and thought. Great job.